I have recently joined a weekly Restorative Yoga class (also called gentle yoga). The yoga has been so beneficial to my physical and mental health that I wish I had the time to attend the class several times a week. Sadly, I do not. But I do have an internet connection and access to gentle yoga "classes" in the comfort of my own home. Whether in a class or at home, there are several items that make this Yoga more effective; mat, blanket, bolster, blocks, and a strap. I want to share a quick overview of these items and the supplier I've found. If you are familiar with the benefits of yoga and yoga accessories, please feel free to jump ahead to the Yoga Accessories store. I have found that they offer high quality items, affordable prices, and fast delivery. I have always enjoyed yoga. And up until a few years ago, I really enjoyed the Yoga Burn type of yoga. The type where I felt as though I was working out and working up a sweat doing it. But as the years have gone by, I have gained weight, lost muscle, lost flexibility, and my lack of range of motion is embarrassing. I have allowed a stressful job to negatively impact my health. I needed something, some form of exercise, that suits my current physical and mental state. This gentle yoga class is good for my body as well as my mind. I am increasing flexibility and range of motion. I am also finding that the meditative style of this yoga is helping me to release stress. I am more calm and sleep much better after the yoga class. I can feel my stress level lowered. In this yoga class, I have been introduced to several helpful accessories; blanket, bolster, blocks, and a strap. As I have begun to do yoga at home, I have found a reliable supplier for these items. I highly recommend Yoga Accessories for your yoga supplies. Mat - Yoga mats are familiar things to most folks. They provide a bit of padding as well as a no-slip surface. 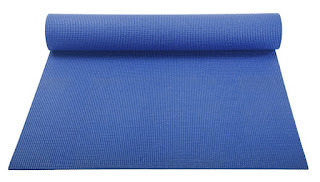 I love that Yoga Accessories offers mats in many different colors. They also offer mats in different thicknesses. My preference is the very thin mat that provides no-slip and a sort of hygienic barrier between me and the floor. But there are also thicker mats of you are looking for more padding. Bolster - Bolsters come in several sizes and either a round shape or a more flattened-oval shape. I am getting a lot of use from my new round bolster. It is used to prop up the knees, to assist while laying in the child pose, and my favorite pose - laying on it along my spine. This pose seems to release tension in my back and shoulders. Blanket - A blanket does what a bolster does, but on a thinner scale. You can also use the blanket to sit on, adding padding between your bottom and the floor. I also often use it under my head and under my neck for padding and support. Blocks - Blocks are used as props for stability and/or for comfort. For example, while in certain poses that are meant to be restful, if you aren't quite flexible enough you aren't able to relax. The blocks can be placed to help you relax. Strap - As I mentioned, I have lost flexibility and range of motion. A few years ago, I could grasp my hands behind my back, lean over, and raise them above my head. Now I can barely clasp my hands behind my back. 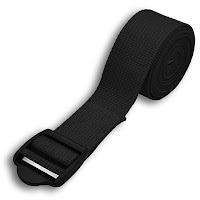 A strap can be used to help with that move until you become able to perform the move without the extra assistance. In only 4-5 weeks time, I am noticing improvement in my flexibility and will soon be working without the strap. I love this gentle yoga so much and am realizing so many benefits from it in just a few weeks that I've begun to practice at home. I was thrilled to find a free video, that is included with my Amazon Prime membership, that is very similar to the class I attend. If you have a Prime membership, you can take a peek at Easy - Gentle Yoga with Michele Fife to see what I am trying to describe. Thanks for being so candid about how you're improving your life with gentle yoga, Dawn Rae. Obviously using the proper accessories makes the job much easier. Right now I'm about as de-conditioned as one can be. You have me actually looking at yoga as a possibility. "Gentle" is a requirement for sure. Thanks for the food for thought and keep up the good work in your life! Your article is extremely helpful to those of us who have never tried Yoga. I think we could all benefit from anything that helps us relieve stress. I especially appreciate the link to the free Yoga video. It will, no doubt, be very beneficial to beginners like me. I take a senior toning exercise class 2X a week, Dawn Rae, and have thought about adding Yoga for the days I do not go to the gym. Mainly because my flexibility is less than desired. :) Appreciate your review of Yoga accessories (which actually can be used along with any type of exercise). Very helpful. I have been doing Yoga for years, and Gentle Yoga works great for those times when I have been injured. The accessories you featured are perfect! I could really benefit from Gentle Yoga. Thanks for introducing me to it and to the resources that will help me get started. Here's to greater health! I had been Yoga at home from a TV show for a while, and need to get back to it. My friends daughter owns a yoga studio and has extensive yoga training of course; she's amazing! I'm lucky to bend to do it lol - and would need all of these tools I suspect. Thanks Dawn Rae for broaching a subject I have been thinking about for quite some time. Like you my mobility has gone down hill faster than a speeding bullet. I need to get some of that flexibility back. I think you have convinced me that gentle yoga is the way to go. I will add that to my water aerobics and swimming and see if things (my body) gets better with that approach to fitness. Thank you for this great review.